The best French fries ever. Set Air Fryer to 360º and preheat for 3 minutes. Toss the fries with olive oil until evenly coated. Season with salt and pepper. Pull out the basket and basket holder and add fries. 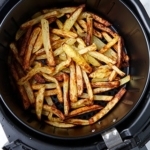 Close the Air Fryer and set the timer to 15 minutes. Shake the basket every 5 minutes to help the fries cook evenly. Cook for an additional 3-5 minutes if the fries are still gold and shiny. The fries are ready when they are a rich golden brown. Season with more salt and pepper and top with chopped parsley.